Steven Universe graced our screens once again with a week of episodes purportedly about fusion and bringing the Crystal Gems together. Instead, a new fusion pairing actually gave us the chance for some strife between the Gems—and it turns out that they are just as fascinating apart as they are together. Garnet’s place as de facto leader of the Crystal Gems has never really been questioned before, but it’s pretty clear that neither Pearl or Amethyst see themselves as strong enough to have taken on that mantle, and that they both have issues with their own worth (Pearl without the guidance of Rose, Amethyst as a Gem “grown” on Earth) that they reflect on Garnet. As Amethyst sings, she used Garnet, the representation of being together with yourself and in control, to make herself feel stronger through fusion. It’s rare to see Amethyst take the spotlight in the show, but her brief time in it here really hammers home that the characters have a lot of personal issues worth exploring—issues you don’t really often see in a children’s cartoon. It’s telling that as the fallout of Pearl’s mistake in the episode’s climax begins, Amethyst doesn’t revel in pointing out that Pearl has screwed up, as you’d almost expect her to. She completely understands why Pearl did what she did. And hoo boy, did Pearl screw up. Not having experienced being Sardonyx for so long, Pearl goes behind the Gem’s backs to rebuild Peridot’s communication tower, just to be able to fuse into Sardonyx again to destroy it. It’s an insanely stupid thing to do, considering Peridot is trying to rally the Homeworld to bring more forces to Earth, and incredibly selfish, too. But given everything we’ve learned about Pearl so far, it’s also tragically understandable why she would feel that way. However, Garnet—who obviously as a Fusion herself takes the process incredibly seriously—can’t help but feel personally betrayed at Pearl’s ulterior motives. As Garnet flies off the handle and refuses to forgive Pearl, for the first time in a very long time Steven Universe ends with something unresolved: something that will have ramifications throughout the rest of this small arc. Roadtrips! And although Garnet is along for the ride as Steven and Greg travel to the Keystone state to pick up some car wash brushes, we spend much less time with her, and more with her component parts: Ruby and Sapphire. The turmoil between Garnet and Pearl leads to Garnet unintentionally splitting up, as her two halves try to reconcile Pearl’s betrayal of the act of Fusion—the hot-headed Ruby incapable of forgiving, and the cool Sapphire assured that things will all work out (mainly thanks to her powers of foresight, which lead to some lovely little jokes with Steven and Greg as she warns about the dangers of square pizza, or which of the motel TV’s myriad channels Steven would like the most). By making Garnet’s debate in her head a literal, external concept, we get to at least understand why she is so frustrated with Pearl—but perhaps disappointingly, this conflict between Ruby and Sapphire is a little too well wrapped up in the show’s 11-minute run time. In a week where the drama between Garnet and Pearl is examined at a slower pace, it feels weird for Garnet to be back together and reconciled with herself so soon. It would’ve been interesting to see Garnet not entirely whole again for an extended period, but at least what we get in “Keystone Motel” is an interesting examination of her two halves. So, there you go then. Definitely more than friends. Ah, another fantastically weird episode with everyone’s favorite creepy neighborhood kid, Onion. The Steven Universe fan base has built up a bizarre sort of background for Onion, with theories ranging from him being some sort of strange old god spawn, to a sinister gem-related villain, to the secret form of the ultimate evil. It’s almost refreshing to discover that Onion is basically just hilariously weird. Although “Onion Friend” spends most of its runtime exploring the ever-increasingly uncomfortable relationship between Onion and Steven as the pair hang out at Onion’s home—with everything from Onion licking a mash potato idol of Steven’s head, to showing poor Steven a videotape of Onion’s birth—we also get to see some more fallout of Garnet and Pearl’s argument through Amethyst’s eyes. It turns out that Onion’s mother Vidalia (who eagle-eyed fans will remember appeared as her much younger self in “Story for Steven”) and Amethyst used to hang out when they were younger, and Steven and Onion’s adventure serves as a catalyst for them to catch up. More specifically, we get to briefly learn how Amethyst is struggling to deal with Garnet and Pearl not talking to each other—not well, it turns out. Without either Gem to turn to, Amethyst’s feelings of weakness and uselessness come to the fore again, only for her to be reminded by Vidalia that there are some people who used to (and still do) see Amethyst as a figure to look up to. It’s a much-needed confidence boost for the young Gem. “Historical Friction” is pretty much the thematic “bottle episode” of this week’s arc—but although pretty much nothing happens in terms of advancing Pearl and Garnet’s fallout, we get a brief, brief addition to Steven Universe’s lore being hinted at again. Mailman/budding actor Jamie returns to Beach City to put on a play about the city’s founding (at the behest of Mayor Dewey, who pretty much wants to use it to prop up his re-election), and Steven is enlisted as the play’s only other actor to help. But the duo discover that Mayor Dewey’s script needs some major reworking, so they turn to someone who was actually there for the city’s founding: Pearl herself, who leaps at the opportunity to be helpful in the wake of the Gem’s current discord. It’s a minor thing (although telling at just how much strife there still is between Garnet and Pearl that Pearl is the only Gem to show up at the opening night of the play), but the reworked play does tell us that the Crystal Gems were around way before the humans of Beach City were, with a gigantic, multiple armed woman—a mysterious fusion that is heavily hinted to be the same fusion depicted towering over the Crystal Gem’s temple—saving the life of the Mayor’s colonial ancestor, William Dewey, and bringing him to shore to safely establish Beach City. This might be an uneventful episode in terms of advancing the week’s ongoing plot, but it’s a cool little reminder at just how long the Gems have been around protecting Beach City and beyond. The week started with a double meaning title (the “Cry for Help” being both Peridot and Pearl’s), and it ends with one, as the Gems are reunited as friends and also discover an ancient Gem spaceship while tracking down Peridot. After another foiled attempt to recapture Peridot leaves Pearl and Garnet’s relationship still frayed, a second foray into a crash Gem ship Peridot attempts to use to escape Earth leaves the pair forced to confront each other, after a trap leaves them stuck in a room with rapidly enclosing walls. 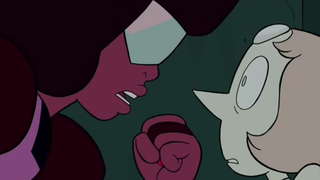 It’s not exactly the most subtle way to bring the building tension between the characters together, but what comes out of it is a heartwarming reconciliation—Pearl finally admits that she doesn’t feel as strong as Garnet does, that she can’t stand alone without someone like Garnet or Rose to guide her. But Garnet equally admits that she herself isn’t always strong, referring to her time apart as Ruby and Sapphire in “Keystone Motel” as evidence that she doesn’t always have control, and that sometimes she has to find strength in her fellow Gems as well. It’s an old trope, but the way Steven Universe dealt with the power of friendship this week, by drawing out the conflict and giving us the chance to see it impact each of the Crystal Gems in different ways, was a great exploration of a pretty well-worn bit of drama. Alas, Peridot escapes the team’s clutches once more at the end—and although I admire her increasing willingness to be a goofy villainous foil to the Gems, I certainly hope that her story is resolved the next time Steven Universe puts the focus on her—but even in quasi-defeat, the Gems appear stronger and more determined than ever in their unity. This week of episodes may not have advanced the show’s overarching story forward, but it was a welcome does of character examination.